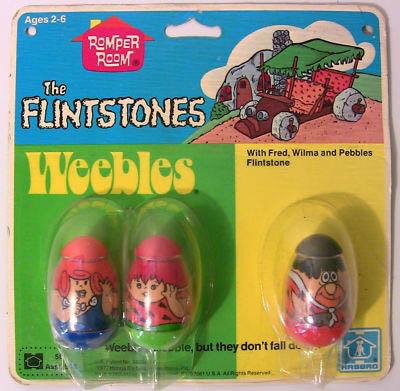 Description: The Flintstones Weebles set is one of the Romper Room Weebles Licensed sets. The set includes 3 Hanna-Barbara Flintstones Weeble figures: Fred, Wilma, and Pebbles. HTW398 - Fred Flintstone - Orange base, black top (hair), orange shirt with white collar and black triangular designs. Holds a club in one hand. HTW399 - Wilma Flintstone - Blue base, orange top (hair), blue one-shoulder dress with white rock necklace. HTW400 - Pebbles Flintstone - Green base, red top (hair), wearing an orange shirt with black triangular designs.